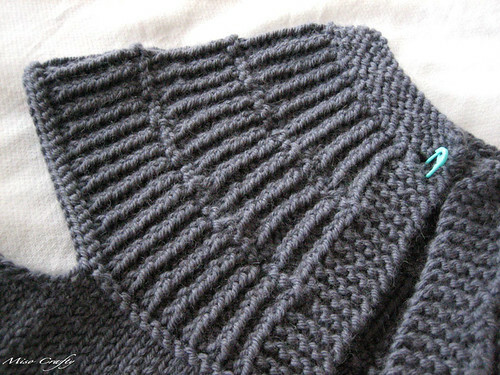 The next project on the go for 12 in 2011: the Shalom cardigan. Yep, after this post I decided to stick with Shalom. She's treating me much better than Juliet ever did. And she's flying off the needles faster than Juliet ever did. I thought Phinney was knitting up pretty fast, well, Shalom is knitting up even faster. Could be because of the bulky weight yarn, a weight that I haven't knit with in quite a long time. There's really nothing much to say about this project, other than it's flying along. I didn't think I would like the 1x1 twisted rib sections on the yoke, being an English knitter and all, but I have to say that I didn't mind at all and truthfully they were completed before I even had a chance to start complaining! I did however, check out some of the other project pages on this pattern on Ravelry (bad idea!) and started second guessing and doubting myself about whether I should have omitted 2 rows per twisted rib section like a lot of other knitters had done. But after trying on my cardigan what feels like a million times I decided that leaving in those 6 rows really didn't matter and that the garment looked fine. What I did realize was that I had forgotten to add in the extra 2 buttons holes that I was planning on doing when I first started the project. Oh well, I'm way too far ahead to rip back now. I guess I'll just have to either wear it with the solo button or invest in a shawl pin so that I can wear it closed at the bust rather than at the neck. I'm hoping to have this knitted up by mid-week and blocked before next weekend. I'm loving how this project has that instant gratification feeling and has really pumped up my motivation for the other projects that I have planned for the 12 in 2011. For a while there I was wondering if I really will get all 12 completed before the year was over. Since I'm a slow knitter I was estimating (and hoping!) that it will take me about a month for each project. Since I haven't finished Phinney (stupid hand sewing!) I was feeling a bit defeated. Now the new goal is to get Phinney done before the month is over...I better cross my fingers. On second thought, I better get knitting! I cast on for my Shalom yesterday and am already beyond the yoke and flying through the body (if only I could get home to knit it NOW!). I've decided to make mine a full cardigan though, sleeves, 10 buttonholes and all. I can't wait to see how yours turns out! I can't wait to see your Shalom too! I thought about making mine a full cardigan too, but then realized that I don't have enough yarn. Oh well!